Yesterday's was M33...so last night I went out and got it...not very good...but check it out in the cafe...it is the center area with my Celestron Evolution 6. The Cave Nebula. Photo: Mark Sibole. I've sometimes tried to make head of tail of the Cave Nebula, but previously I have given up, because I haven't understood how it works. But now I think we are looking at an ionization front, although we can't see an obvious newborn cluster of stars that is causing the ionization. But I have begun to think that maybe HD 217086, a seemingly slightly lonely O7-type star, is the true power engine of the Cave Nebula. 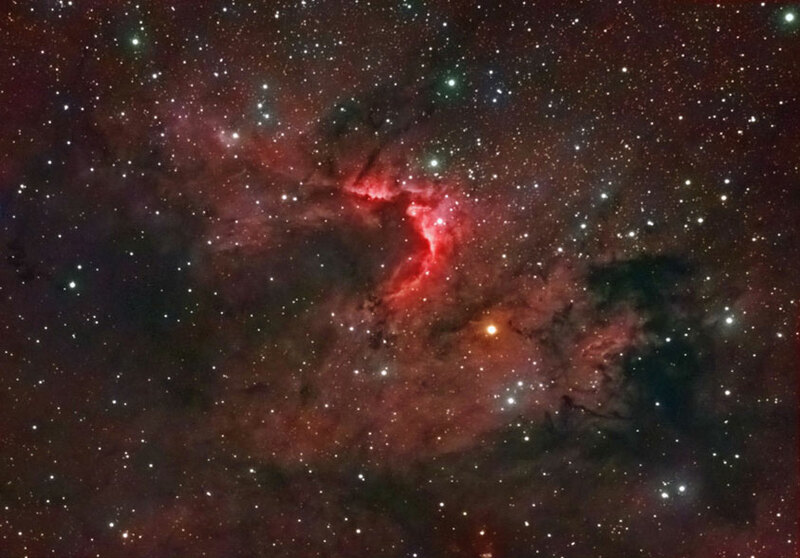 I think the mechanism behind the Cave Nebula becomes clearer in the picture at left by Mark Sibole. The ionization front is outlined in bright red. The O7-type star eating away at this structure, HD 217086, is the greenish-looking star that is located just above the red glow. The greenish-looking star closer to the top of the image is probably KZ Cep, and it, too, may play a part in ionizing the nebula. New stars are born along the red ionization front. The whitish looking star just to the upper right of the brightest, whitest part of the ionization front is HD 217061, a B1V-type star that has probably quite recently emerged from the fury of the ionization front just below it. There is actually one more O-type star in this picture, and that is the brightest of the bluish-looking stars to the lower right of the bright orange star in the middle of the picture. This other O-type star is HD 216898, an O8.5V-type star. This star may ionize the fainter part of the red ionization front, the part of it that is facing its way. What about the prominent orange star close to the center of the image? I'd say that this is the Betelgeuse of the Cave Nebula, a red giant that started out as a blue star hot enough to blow a cavity around itself and ionize the remaining gases. So the fact that this star seems to sit in the center of a cleared-out cavity is probably no coincidence. This star, HD 216945, may have been the one that got the nebula going in the first place. But now this star has swollen into a cool red giant, and it can't do any ionizing any more. The blue stars HD 217986 and KZ Cep must be the second generation of hot bright stars in this nebula, opening up new ionization fronts here. And HD 217061 may be the third generation here. And we can already see yet another star emerging from the dust inside the red glow of hydrogen. Last edited by Ann on Fri Sep 28, 2018 3:54 pm, edited 1 time in total. Not that it matters greatly, but I notice a wording change this time, from APOD's usual "toward the constellation" to the traditional "in...." Am I the only one that finds the former wording somewhat awkward, and prefers the latter? You are not. "In" is by far the better choice.